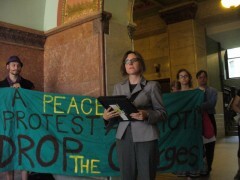 Protest demands drop the charges against anti-foreclosure activists | Fight Back! Minneapolis, MN – More than 50 people rallied inside City Hall here, July 24 to demand all charges be dropped against members and supporters of Occupy Homes who were arrested defending the Cruz family home. In recent weeks, city prosecutors added the charge of third degree riot - a gross misdemeanor which carries a sentence of up to one year in prison and a $3000 fine - to the original trespassing charge. The 14 were arrested May 30 in a peaceful protest at the Cruz family home. Speaking in City Hall, Rachel Lang of the National Lawyers Guild announced the start of a campaign to press city officials to drop the charges. Other speakers included hip-hop artist Brother Ali, Michael Friedman of the Legal Rights Center and Dave Bicking, formerly of the Minneapolis Civilian Police Review Authority. The decision of city officials to escalate the charges against anti-foreclosure protesters is an attempt to attempt to intimidate activists. The protests organized by Occupy Homes have garnered international media coverage and has been successful in saving the homes of those hit by foreclosures.